V is an all-purpose File Manager for Windows with a powerful inbuilt text file viewer which excels at viewing files quickly - whether they are 100 bytes or 100 gigabytes. It is an indispensable utility for anyone who spends much time navigating directories and viewing files. 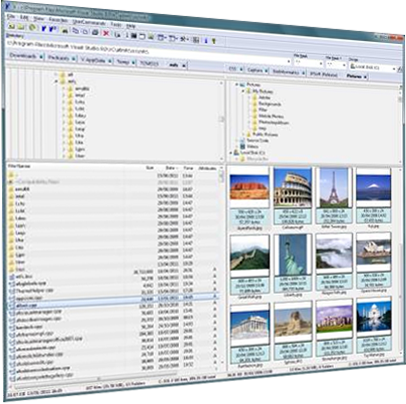 The V File Viewer has an optional dual pane interface which makes it easy to copy/move files from one directory to another. Folder Tabs allow you to view favorite directories with a single mouse click (or key press). A Thumbnails Mode makes browsing image directories a breeze. For those who prefer to work in a Command Prompt, V is fast and convenient - just type V Filename and the file is right in front of you. There is no need to switch to Windows Explorer and certainly no need to bring up a File Open Dialog Box! EBCDIC support (including common RECFM formats) makes it ideal for those who work in a mainframe environment.